‘Native Orchids of Southern Sydney‘ is a wonderful new book from Sydney native orchid expert Margaret Bradhurst. Margaret has been finding, photographing and recording native orchids in the southern Sydney area for the past 25 years. Her book ‘Native Orchids of Southern Sydney’ is designed to be an identification guide that will help people identify the orchids that they may come across in the bush. The knowledge that Margaret has accumulated over the years is reflected in the wealth of information that is to be found in the 70 pages of this A5 book. There are 185 coloured photographs and easy to follow details of the key features of 120 different species found in the area. The book includes the botanical and common names of the plants, their flowering times and notes about each genus. Information is also included on the types of habitats where orchids might grow along with a glossary of botanical terms used. The book’s compact size means that it can be easily tucked into your backpack when you head off onto the bush. 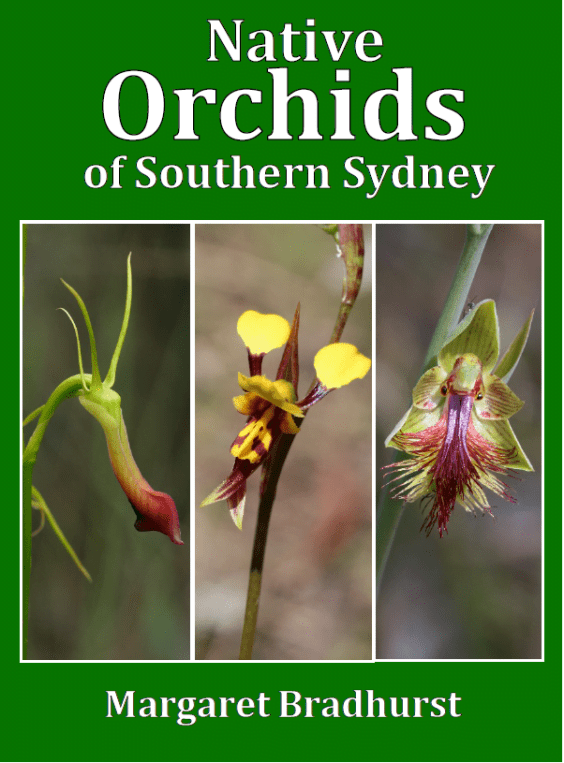 As well as being a useful identification guide to the native orchids of southern Sydney, Margaret hopes that after using this book the reader will become more aware of how unique and precious these native orchids are and in some small way this may help to preserve these fascinating plants for the future. The book costs $20 (plus extra for packaging and postage) and may be ordered by contacting Margaret Bradhurst via email on mbradhurst1@bigpond.com.